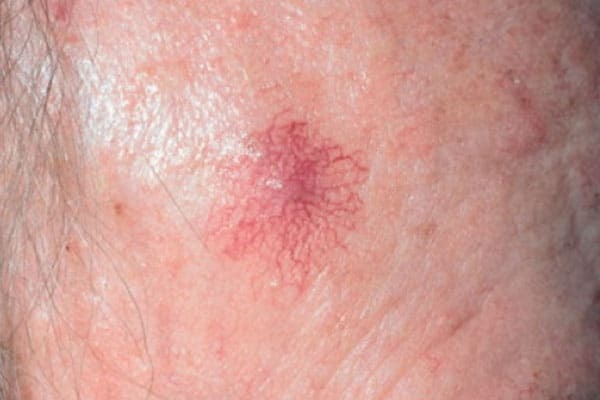 A spider angioma (also known as a nevus araneus, spider nevus, vascular spider, and spider telangiectasia) is a type of telangectasia (swollen blood vessels) found slightly beneath the skin surface, often containing a central red spot and reddish extensions which radiate outwards like a spider web. They are common and may be benign, presenting in around 10-15% of healthy adults and young children. However, having more than five spider naevi may be a sign of liver disease. 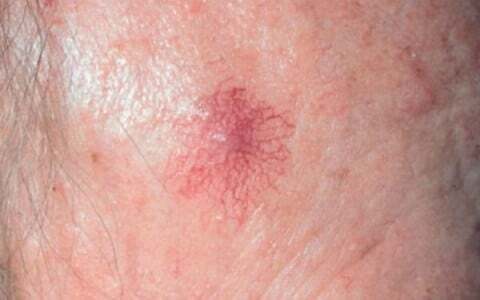 Spider angiomas are found only in the distribution of the superior vena cava, and are thus commonly found on the face, neck, upper part of the trunk and arms. They may also be present on the backs of the hands and fingers in young children. Spider angiomas are due to failure of the sphincteric muscle surrounding a cutaneous arteriole. The central red dot is the dilated arteriole and the red “spider legs” are small veins carrying away the freely-flowing blood. If momentary pressure is applied, it is possible to see the emptied veins refilling from the centre. 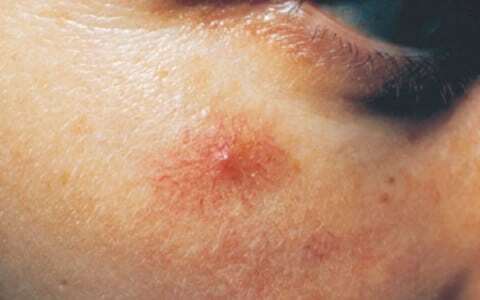 No other angiomas show this phenomenon. The dilation, in turn, is caused by increased estrogen levels in the blood. Many pregnant women, or women using hormonal contraception, have spider angiomas, due to high estrogen levels in their blood. Individuals with significant hepatic disease also show many spider angiomas, as their liver cannot metabolize circulating estrogens, specifically estrone, which derives from the androgen androstenedione. About 33% of patients with cirrhosis have spider angiomas. As such, microhemorrhages may be observed as spider angiomas. Spider angiomas are asymptomatic and some resolve spontaneously. This is common in the case of children, although they may take several years to disappear. If the spider angiomas are associated with pregnancy, they may resolve after childbirth. In women taking oral contraceptives, they may resolve after stopping these contraceptives. The spider angiomas associated with liver disease may resolve when liver function increases or when a liver transplant is performed. For spider angiomas on the face, techniques such as electrocautery and laser treatment with Intracel or Pulse dye laser can be used to remove the lesion. There is a minor risk of a scar, although the results are generally good. Spider angiomas may reappear after the treatment. If the centre of the angioma is pricked with a hypodermic needle, opening the dilated arteriole, blood will flow freely for some time unless pressure is applied; the arteriole will then shrink or coagulate and the angioma will disappear. This treatment is minimally painful and leaves no scar. Used in dermatological procedures to stop bleeding (hemostasis) or to destroy abnormal skin growths like: Skin tags, Warts, Pyogenic granuloma. Intracel is an innovative, skin resurfacing technology that delivers heat energy below the surface of the skin. Intracel Fractional Radio Frequency microneedles directs the RF energy just below the skin for an efficient treatment with minimal downtime. The pulsed dye laser is a device that produces a bright light that is absorbed by abnormal blood vessels, which are destroyed without damaging the surrounding skin. The laser uses yellow light, which is safe and does not result in long-term skin damage.